As many collectors know, way leads on to way and we often find ourselves intrigued by a new area of collecting interest – perhaps one we have never even heard of before. Like many token and medal enthusiasts, I started (as a child) with coins. Many years later, at a coin show, I stumbled into the realm of tokens, which I entered with the memorable question, “What’s this?” Well, from exonumia in general, I soon discovered Civil Wars, Hard Times, military tokens, trade tokens, encased cents, Masonics, politicals, key tags…in a never-ending journey of new discoveries, each with its own excitement and opportunity for the “professional growth” of an obviously incurable collector. One day, an unexpected listing showed up in response to my eBay search parameters. 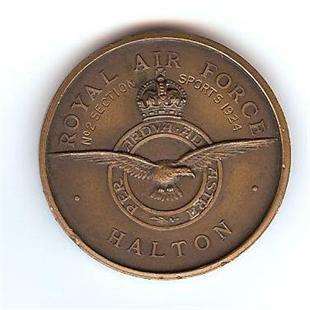 Being born in England and having a long-term interest in the Royal Air Force, I had been scanning for RAF base tokens. The U.S. military had issued a number of these in the 1950’s and 60’s for use at such places as Upper Heyford, Lakenheath, High Wycombe, and Alconbury. These are of the same series as those made for a great many overseas and domestic bases, and are well-documented in James Curto’s and Paul Cunningham’s guides to U.S. military tokens. The British have also made a few tokens for their military establishments, including air bases, and I have managed to snag a few of these as well. These have to some extent been outlined in the 1998 book by Australian John Yarwood, A Guide to British Military Tokens. With only a very few exceptions, all of the British issues seem to be extremely rare. So, in scanning eBay for RAF exonumia, I get the occasional big surprise, and one day I found myself staring at a jpeg of a Small Arms Association shooting medal, wondering once again, “What’s this?” I adjusted my search criteria and before long was seeing an ever-expanding series of RAF sports-related medals. For someone who loves history, and the RAF in particular, these were an undiscovered gold mine. 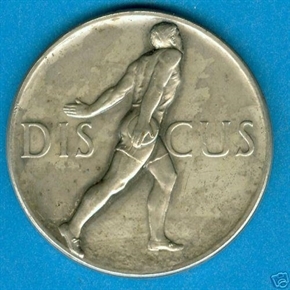 1) SIZE: The planchet diameter of these medals varies greatly, from as small as 1.0 inches (26mm) to a whopping 2.01 inches (51mm), with most in the 1.25 to 1.5 inches range (about 30-40mm). 2) MATERIAL: I have seen examples in 9ct gold, hallmarked sterling silver, enameled sterling silver, base silver, white metal, bronze, “gilded” bronze, brass, and copper (it is evident that the size, expense, and quality has diminished over time and that there are pronounced differences between those made in the 1920’s and those made during and after WW2). 3) PLANCHET: These are almost always round but occasionally irregular. Some are obviously a standard medalist’s issue, perhaps with an integral crown atop an otherwise round planchet – only made “RAF” by the engraving. Others are extremely unusual and possibly unique (see RAF Thornhill in the upper left of the group photo to follow and the acorn-shaped planchet of RAF Leuchars pictured below). 4) SUSPENSION: Many appear to be intended as fobs, given their small size and suspension rings. Larger ones with rings may have been worn either pinned or around the neck, but I have never seen one, large or small, offered for sale with a ribbon, pin back, or chain. I have, however, seen other shooting medals with ribbons and pin backs (Royal Signals and Royal Engineers); and an online RAF Boxing Association photo taken in 2004 shows the champion being awarded a medal complete with ribbon. It seems safe to assume, therefore, that some were issued with ribbons, or at least that a ribbon could be added later by the recipient if desired. Only two of about 20 RAF shooting medals have had suspension rings (dated 1924 and 1955), but more than half of about 35 medals representing other sports do. 5) BOXES: A few have been offered for sale in elegant, fitted jeweler’s boxes and others in more simple cardboard boxes. Most, however, do not come with boxes, although I believe that most of them originally did, given the very similar or even identical designs which from time to time do appear with their boxes. 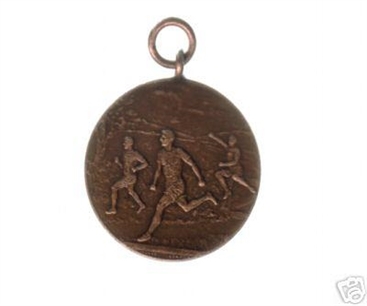 A 1929 2nd place shooting medal came in a fitted box from medalists H. A., Shelley & Co., 12 Holborn Viaduct, London E.C.1. 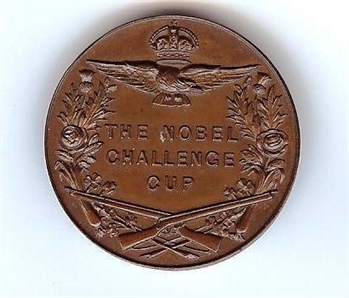 A bronze shooting medal of 1951 came in a simple cardboard box that bears: F. Phillips, Medallist & Silversmith, Aldershot, England. 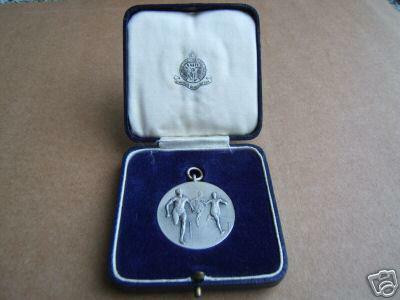 A silver 1st place medal for the same year, 1951, came in a more stylish, fitted box whose inside lid reads: Established 1835, Masonic Outfitters, Toyé & Co., Ltd., 26, Red Lion Square, London W.C.1, Liverpool & Manchester. Another came in a fitted box from Elkington & Co., Ltd. (of Birmingham). Some of these sources use two l’s in the spelling of medallist, while others use only one. The lettering may be so tiny and so well hidden that it can be challenging to find the medalist’s inscription. Many have no such inscriptions, but the sterling silver and the more sophisticated medals usually do. With experience, one can identify some of the characteristic styles and even tell at a glance that a particular medal is probably a Phillips, a Finches, or a NAAFI issue (occasionally confirmed on closer examination). I have also noticed that medals that come in fitted Phillips, NAAFI, or Toyé boxes do not always bear the medalist’s name. 7) DATES: Most but certainly not all are dated, and the dated ones I have seen range from 1924 to 1980 for shooting and 1919 to 1957 for other sports. I must mention that the RAF only came into being in 1918. Other British military sports medals certainly predate this, and similar medals, RAF and otherwise, are still being awarded today. 8) DESIGNS: Most have, on one side, an illustration of men racing or playing the relevant sport, such as cricket, boxing, shot put, discus, hockey, or fencing. Others simply portray the “tools” of the sport, such as crossed rifles, a single revolver, crossed hockey sticks, or crossed ping pong paddles. Some, however, bear only a symbolic reference, such as a pair of fish to represent swimming. 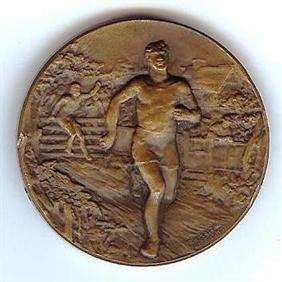 The relatively common Athletic & Cross Country Association medals come in at least two sizes and show one man affixing wings to another (depicted at lower left of group photo), while the engraving tells us the event for which it was awarded (high jump, 100 yards race, tug of war, etc.). Another design shows only the RAF crest with albatross and motto per ardua ad astra (through adversity to the stars), while the engraving on the back tells us it was awarded for a 6 miles walking race. 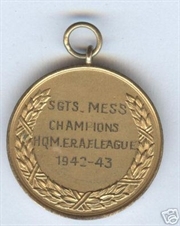 A few bear just a wreath on one side, blank on the other, and only indicate the nature of the award by the engraving, as in the football award of 1944 pictured below. 9) ENGRAVINGS: For present purposes, engraving refers to the incuse lettering applied to the particular medal, and inscription is used to refer to the raised lettering that appears on all medals struck with the same design. Most are engraved to the reverse, but I have seen a couple with names engraved on the obverse and all other details on the reverse, and I have seen a few shooting medals engraved along the edge. On some of the silver medals, the engraving has also been colored gold. I have occasionally seen medals with no engraving at all. Examples include a boxer or a pair of fencers depicted on one side but nothing except a crest and/or the issuing organization’s name on the other. I have also seen Athletic & Cross Country Association blanks with the raised “attained athletic standard” but no engraving, and the same for a medal bearing only the RAF crest and wreaths. Perhaps these are blanks that have simply not yet been awarded, but more likely it may have been up to the recipient himself, at least sometimes, to choose and pay for the engraving. This would certainly explain the enormous variation. The engravings follow no consistent patterns. Some are very detailed, giving date, purpose, unit, and location, and naming the recipient, including rank. A Boxing Association medal (group photo lower right) states that it was awarded to: L.A.C. [Leading Aircraftman] BAKER F.W. / WINNER / NO. 1 GROUP / MIDDLEWEIGHT / CHAMPIONSHIP / 1924. 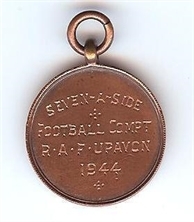 A football medal reveals that it was awarded to the R.A.F. / SENIOR / SOCCER CUP / HABBANIYA / RUNNERS UP / 134 M.U. [maintenance unit] / J. FRENCH / 1947-48. 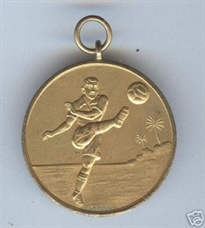 Curiously, this particular medal includes both the winning team and the individual player’s name; most seem to give one or the other but not both. Other engravings are not so generous; one pictured previously merely tells us that a particular boxing award came from (or went to) RAF LEUCHARS. Most are somewhere in between, though, as for example when the raised lettering ATTAINED ATHLETIC STANDARD is followed by the engraved details: 100 YDS / 220 YDS / HIGH JUMP / LONG JUMP / GEJ CAPLIN / 1926. But this one is very unusual in that one medal concerns four achievements. Another, with no sports-related design, reveals that it was given at RAF Thornhill in 1944 to the INTERHUT / SOCCER LEAGUE / WINNERS (see group photo upper left). An example of the edge engraving appears on a silvered Small Arms Association medal, with crest and crossed rifles (almost identical to the one pictured in the center of the group photo but not engraved on the reverse). Its edge reads: R.A.F. S-B PISTOL TEAM 1st STAGE 1st 1951 [S-B probably means “small bore,” .22 caliber]. The only handgun design I have seen merely shows a Webley revolver on one side with the reverse engraving, SMALL ARMS ASSOCIATION 1955 (pictured at left in middle row of group photo). The crest on this piece is most interesting, portraying not the RAF crest and motto but instead the mythical griffin surrounded by SECOND TACTICAL AIR FORCE / ROYAL AIR FORCE / KEEPERS OF THE PEACE. I have also seen medals struck with the crests of the RAF Maintenance Command, 11th Fighter Group Headquarters, RAF College, and other RAF units, in contrast to the crest of the RAF as a whole. An interesting opportunity to study the absence of consistency comes from a set of four sports medals that came from a Sgt. B. Naylor, who was stationed in Egypt from 1949-50 and in Ceylon (Sri Lanka) in 1954. They indicate that the same individual may have won awards for: more than one sport (one for football, three for hockey); in any years of service (1949-54); at any station (Negombo, El-Firdan) or just the country (Egypt) or just an abbreviation, such as RAF-M (probably RAF-Mesopotamia, now Iraq); with or without the recipient’s name (Sgt Naylor, B. Naylor., or no name); with or without punctuation or initials; and with or without rank. 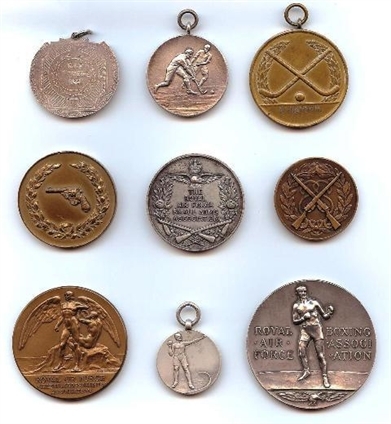 It also indicates that awards for the same sport during the same time period may come in different designs, different sizes, and different metals, even when both silver and brass are engraved, “WINNERS.” I’m reminded of an old ditty about things English: “It may seem odd, but it works.” Two of the Naylor hockey medals are illustrated in the upper right of the group photo. 10) NAMES: As mentioned in the previous section, these medals may or may not be named, and when they are, they may or may not include rank. What seems clear is that most if not all name engravings were a later addition by the recipient. The engravings and inscriptions on many medals are off center, leaving space for additional engraving (see middle and lower left reverses in group photo). Alternatively, space may be left available for this purpose by leaving the reverse sides blank (as on the RAF Upavon medal previously illustrated), or by leaving defined raised areas free (as below the crossed hockey sticks in the upper right of the group photo of obverses). Sometimes the lettering of the name is of a different style than the other engraved lettering. 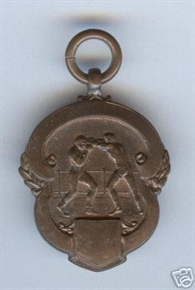 The reverse side of the boxing medal at the lower right of the group photo gives a clear example of this variation. 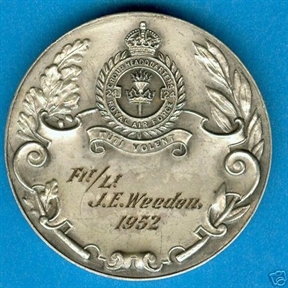 The obverse and reverse engraving of the hockey medal at upper right also shows marked variation (thinner lettering on reverse).That the names were added by the recipients is supported by discussions through the online British Medal Forum http://www.britishmedalforum.com One RAF veteran wrote that athletic medals awarded to him were never named, and that it only stands to reason that the recipient would have arranged the engraving “because they wouldn’t know who the winner was until the end of whatever competition.” He added that “The medals I got in the RAF for athletics were just trinkets, the sort that you would buy in a trophy shop in any town and pretty worthless really. 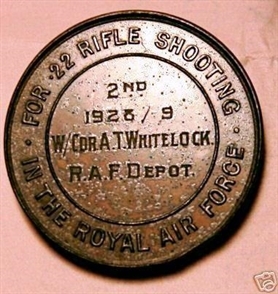 All they have is the competition, date, the event (400m) and 'First' written on it.”Of about 26 shooting medals, only those that were awarded to a Wing Commander Whitelock are named. Of about 35 medals from other sports, about a third are named. 11) LOCATIONS: One of the many interesting features of the RAF sports medals is that they represent installations from all over the world. Most are easily researched on the Internet. Many come from home bases (11 Group HQ at Uxbridge, on the west side of London; RAF Gosport in Hampshire; RAF Leuchars in Scotland). Others come from Habbaniya or Hinaidi (Iraq), Negombo (Sri Lanka), Shandur or El-Firdan (Egypt), Thornhill (Rhodesia), and so on. 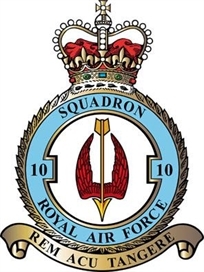 12) SOURCE OF ISSUE: Because most of the medals were struck with some information, designs, or crests before the later engraving, it is obvious that some were issued by RAF squadrons (such as 8 Squadron) or stations (RAF Halton, RAF Cottesmore, RAF Gosport); or by command units (11 Group, 24 Group, Maintenance Command); or by installations such as the RAF Depot or the RAF College. But many represent RAF associations: the RAF Small Arms Association, the Second Tactical Air Force Small Arms Association, the British Air Forces of Occupation Small Arms Association, the RAF Athletic and Cross Country Association, the RAF Fencing Union, RAF Swimming Association, or RAF Boxing Association. Many of these associations are still active and holding competitions today among current members of the Royal Air Force. A brief search of the Internet leads to websites for the RAF Boxing Association, Swimming Association, Small Arms Association, Athletic Association, and Fencing Union. Strangely enough, no historical information seems to be given, except that, for example, the Small Arms Association briefly mentions that it: “was founded in 1921 with the object of promoting interest in small arms shooting for Service purposes by means of individual and collective competitions framed as far as possible to induce practice in methods which will lead to increased efficiency in these arms.” But other units, bases, and associations no longer exist, often due to disbanding, change of names, or assimilation into other organizations. For these, their sports medals are particularly significant as artifacts of an earlier time.Sometimes the source of a medal is not clear. 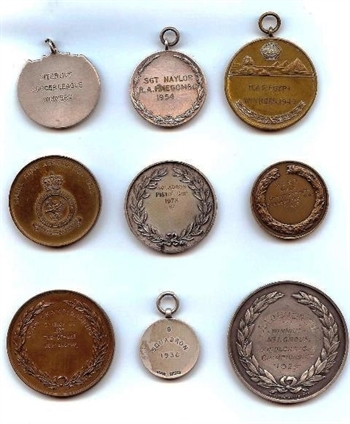 Was a NAAFI shot put medal (group photo bottom row, middle) awarded BY the engraved 8 Squadron in 1930 or TO the competitor(s) from 8 Squadron – in other words, did 8 Squadron host or win the shot put competition? When such engraving is very much off center, or the reverse is blank, or a raised area seems reserved, the medal was probably issued just that way so that the recipient, if he so desired, could later add his own information. 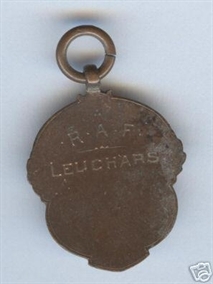 In response to the question, it seems safe to assume that the medal was issued by 8 Squadron to the winner of the squadron shot put competition. If instead it had been issued to 8 Squadron, then at the time of the competition, there would have been no identifying information whatsoever (and as it is, there does remain enough room to add a name). This discussion continues in the next paragraph. 13) SPECIAL INTEREST: Occasionally, ephemera can be found that relates to a particular topic, and a particular paper collectible may add a great deal to support some other collectible. In this regard, there was recently an eBay listing for an advertising flier for the Royal Air Forces Association, Cambridge Branch, Football Challenge Cup between RAF Bassingbourn and RAF Gravely, held at the Cambridge town football ground on a particular Saturday in some long ago May. 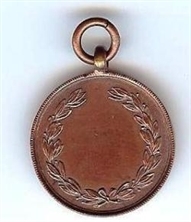 In reference to the question in the previous paragraph, could this be an indication that a medal (below) engraved R.A.F. 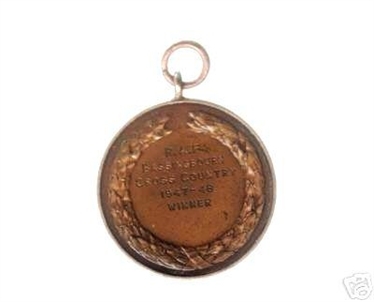 BASSINGBOURN / CROSS COUNTRY / 1947-48 / WINNER was awarded to and not by the RAF station at Bassingbourn? If Bassingbourn beat Gravely, wouldn’t Bassingbourn receive the award? Well, I think not and for several reasons. First, the off-center engraving leaves ample room for addition of a winner’s name, and so “RAF Bassingbourn” was surely engraved prior to the competition, suggesting that it hosted, not won, the competition. Secondly, if Bassingbourn had been the winner, then the medal would bear the name, a different name, of the competition host (perhaps “Royal Air Forces Association, Cambridge Branch”), which of course it does not. Finally, I suspect that medals were issued to individuals and that trophy cups were issued to teams (as was reported to me by a Royal Signals Rifle Association winner). 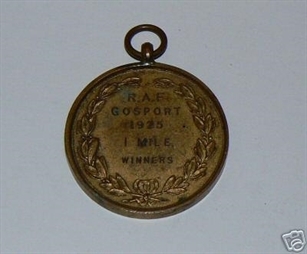 Given such medal inscriptions as JUNIOR CROSS COUNTRY CHAMPIONSHIPS / 1924 / WINNING TEAM and No. 90 GROUP / S.A.A.-BISLEY-1955 / STATION TEAM MATCH / S.R.a. WINNERS (both off center with room to add names), it seems clear that individuals received these medals, even when they competed as members of a team. Ephemera relating to tokens and medals can often yield valuable information. As examples, postcards may illustrate hotels or ships that issued tokens. In researching a confectioner who had issued a good luck “token,” I once found a bill of sale giving details as to what he sold and at what prices (in 1922). Perhaps specific details of RAF sports awards could be researched with access to local or armed forces newspapers or magazines that may have reported the event. Major newspapers are often available on microfilm, and current competition winners are often announced through online news reports. W/Cdr Whitelock was apparently an exceptional marksman, and my medal (below) is one of a series of about eight that came on the market from his personal collection. Most mornings, I have my coffee with eBay, and I have been watching the explosive growth of this amazing techno-phenomenon that has linked buyers and sellers from every corner of the globe and completely changed the face of our hobbies. 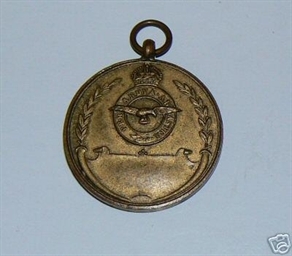 Without eBay, I am not sure I would ever have discovered that there even was such a thing as a Royal Air Force sports medal, let alone acquire a small collection. Having watched eBay for many years now, it is obvious that supply and demand are still very much alive and at work. At first, a number of rare collector’s pieces may suddenly appear at fabulous prices, but the window is small before others discover them. These RAF shooting medals have drawn interest! As they taught me in driving school, “I am not the only idiot on the road.” I managed to buy a cool dozen between 2004 and 06, usually as the only bidder and always at less than £3 ($6) each. But the last few have gone way above that. After getting outbid on about ten shooting medals in a row, I was lucky to get the last of the Whitelock series at £12.30 ($25). I am beginning now to see the same thing with the other sports medals. Once discovered, it only takes a second determined bidder to drive the prices way up, and when forums, dealers, friends, and (perish the thought) TAMS articles draw the awareness of other incurable collectors, hang on to your wallets – the race is on! The foregoing article is reprinted with permission as it appeared in the August 2007 journal of the Token and Medal Society (TAMS). Author and TAMS member would be happy to share with others who have interest or experience in this topic.